THE ruling Patriotic Front says it will petition the Sesheke parliamentary by-election results because it was induced by violence. There was violence perpetuated by PF and UPND in the Sesheke by-elections, which left many people from both parties injured. 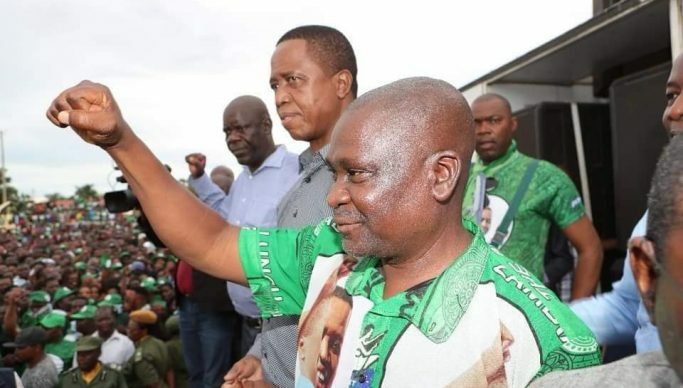 In a media briefing today, PF Secretary General Davies Mwila blamed opposition UPND for the violence that characterised the by-election while demanding for an explanation why PF cadres became victims of police brutality. “We demand the police service to explain why they were so brutal to PF supporters. We demand answers as our members have suffered a lot from police brutality, and we want to salute our gallant youths who escaped the brutality from the police who must protect them,” said Mwila. He also demanded to know why PF supporters were ‘butchered’ like criminals at the hands of police. “With this, let me make it clear that our party will petition the Sesheke results, and we are busy preparing for the Bahati parliamentary by election,” he said. Mwila also blamed mysterious manipulation employed by UPND to intimidate the opponents. “The United Party for National Development was using physical violence and bloodshed to retain the seat. The opposition used mysterious magical manipulation together with some overzealous policemen who brutalized unarmed PF members in Sesheke,” he said. And Mwila has since expressed excitement on the PF scooping all seven ward by-elections in Tuesday’s vote. Meanwhile, PF deputy secretary General Mumbi Phiri claiimed the UPND had resorted to using witchcraft during campaigns in order to win elections. Speaking when she called in on UNZA Radio’s Lusaka Star Programme featuring PF media director Sunday Chanda, Tuesday, Mumbi also condemned UPND national chairperson Mutale Nalumango for referring to President Lungu as Edgar. UPND candidate Romeo Kang’ombe was declared winner of the Sesheke parliamentary by-election after polling 7,768, ahead of the closest rival Dean Masule of the ruling Patriotic Front with 3,297 following provisional results. Returning Officer Joseph Kanyemba this morning announced Kang’ombe as the winner after counting and tallying the received 35 of the 43 polling stations results. Kanyemba announced that People’s Alliance Congress candidate Charity Muhau scored 137 votes, Victor Kalimukwa of United Prosperous and Peaceful Zambia had 141 votes, Masule had 3, 297 and Kang’ommbe had 7,768 votes while rejected votes were 76.